A just transition should be ensured as part of the process of moving away from fossil fuel dependence and transforming current energy systems around renewable energy sources and in the service of people and the promotion of sustainable development. Children arekey to the future of humanity, and yet remain largely invisible and voiceless in society; efforts must be undertaken in earnest to ensure that mechanisms are put in place to enable them to be heard in policy-making processes and that they are assured of the environmental resources essential to their survival and well-being. Ensuring the protection of the basic rights of people amidst the impacts of climate change, such as the right to life, food, right to decent housing and clean water. Seriously committing to a global target of keeping temperature rise below 1.5 degrees. Promoting the use of organic farming and agro-ecology. Ending dependence on coal-fired power plants and other dirty sources of energy. Putting in place a just transition to renewable energy and low-carbon economies and societies. Stopping the promotion of false solutions to the climate change crisis such as “clean coal” technologies, agrofuelsand big dams. Calling on ASEAN governments to demand accountability from developed countries historically responsible for the climate crisis. Demanding climate finance for the adaptation needs of ASEAN countries. Calling on ASEAN governments to demand that developed countries implement ambitious, fair and equitable Nationally Determined Contributions (NDCs). Ensuring efforts in transitioning towards sustainable economies and societies that put people, not profit, front and center of development perspectives and directions. 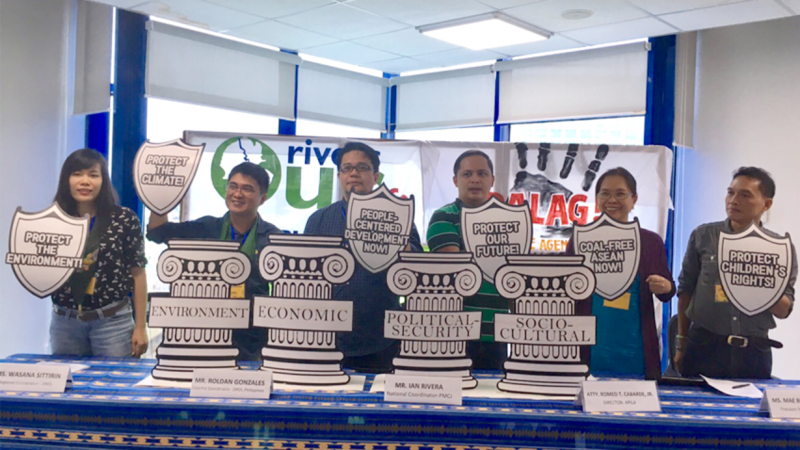 For civil society, strengthening advocacy by forming a regional body on the environment and climate change, and developing a blueprint or roadmap to advance our issues and demands. Forging biodiversity and biosafety agreements in ASEAN with biodiversity conservation as one of its main goals. Strengthening the protection of ASEAN Heritage Sites. Ensuring the protection of agricultural areas, and ASEAN food security. Updating the biodiversity profile of each member country. Strengthening the protection of and sustainable use of shared ASEAN marine resources. Building regional consensus and positions on sustainable mining that rejects the profit-driven, extractivist enterprise that it is today in the hands of multinational corporations, fully takes into account the Earth’s limits and is undertaken in the context of sustainable development and national industrialization. Integrating protection of biodiversity and the environment in school curricula. Raising awareness, respecting and promoting indigenous knowledge and practices as an important source of lessons in environmental and biodiversity protection. Strictly enforcing policies on bioprospecting/biopiracy of indigenous knowledge and endemic species. Putting a stop to the conversion of agricultural lands to residential, commercial and industrial uses and prioritizing support for farmers through direct subsidies to farmers’ cooperatives. Promoting peoples’ access to clean, renewable energy, and prioritizing peoples’ needs for energy above the interests of big business. Supporting participatory and community-based energy management systems. Reviewing and auditing all existing coal-fired power plants, and stopping the construction of new coal facilities. Pushing for a stop to the construction of the ASEAN regional energy grid which will primarily serve big business interests, not the interests of people for the realization of their right to clean, adequate and affordable energy access. Putting a stop to financial flows to dirty energy and other fossil fuel investments, and developing a responsible finance policy that promotes renewable energy development. Ensuring that efforts are made to stop dirty energy funding in ASEAN by international financial institutions such as the ADB, World Bank, IMF and AIIB. Upholding water as a human right and that ASEAN’s drive for energy does not impinge on this right. Resisting false solutions to the climate crisis that put freshwater resources at great risk, and further constrain access especially by poor and vulnerable communities. Ensuring the protection of water sources from pollution and the impacts of climate change. Defending peoples’ rights to sufficient, affordable, clean, quality water and the sustainable, equitable and democratic use and management of water resources. Stopping and reversing the privatization and commodification of water. Ensuring compliance with the Convention on the Rights of the Child (CRC), of which all ASEAN member countries are State Parties, the harmonization of domestic legislation and enforcement of existing laws. Expanding the substance of the CRC to integrate Ecological Child Rights as a major child protection concern, and in line with the principle of intergenerational responsibility. Instituting and ensuring enforcement of stronger protection and accountability mechanisms by mining corporations particularly in relation to children in affected communities. Ensure the enforcement of ASEAN instruments against child labor and child trafficking. Integrate Ecological Child Rights in school curricula. Ensure the development and establishment of mechanisms for the genuine and substantive participation of children in the integrated management of rivers and other water systems, including those that are cross-boundary in nature. Ensuring that projects in environment conservation areas are rigorously evaluated for protecting biodiversity, and promoting human rights, particularly compliance and the UN Guiding Principles on Business and Human Rights. Demilitarizingancestral domains and environmental conservation areas. Developing an ASEAN standard for the fiscal regime for extractives. Increasing the representation of civil society organizations in the Extractive Industries Transparency Initiative (EITI). Integratingsustainable development and natural resources management in peace processes. Strictly enforcing the policies of the United Nations Convention on the Rights of the Child (UNCRC) against child soldiers. Ensuring the strict implementation of the international humanitarian law. Ensuring transparency in development projects and diligently reviewing potentially adverse impacts on Moro and indigenous communities, such as displacements and environmental destruction. Putting an immediate stop to all forms of development aggression and militarization in Moro and indigenous communities.